What’s the best way to stay current on funding opportunities? To stay current on funding opportunities, we recommend that faculty sign up for e-mail alerts from government sponsors. These alerts automatically send you an e-mail notification when a new funding opportunity becomes available in your area of interest. Some of the most popular federal e-mail alert services are provided here. What is the difference between a gift and a grant? The terms gifts and grants are often used interchangeably'; however, a grant is more restrictive than a gift and requires different monitoring and accounting procedures. The award instrument is an agreement that binds the University to a set of terms and conditions and requires endorsement. The agreement obligates the investigator to a line of scholarly or scientific inquiry that typically follows a plan, provides for orderly testing or evaluation, or seeks to meet stated performance goals. The agreement establishes an understanding of how funds will be used or includes a line budget that identifies expenses by activity, function, or project period. The agreement requires fiscal accountability as evidenced by the submission of financial reports to the sponsor, an audit provision, or the return of unexpected funds at the conclusion of the project. The agreement creates an obligation to report the project's results or dispose of tangible or intangible properties resulting from the project. Examples of tangible properties include equipment, records, technical reports, theses, or dissertations. Intangible properties include rights in data, copyrights, or inventions. The agreements seek considerations such as indemnification, or imposes other terms that require legal accountability. NOTE: Investigators who expect to solicit funding from sponsors should consult with OSP especially when nonstandard agreements, such as those offered by industrial firms, are anticipated. Gift accounts are established when funds from outside sources are for unrestricted use and are free of the constraints or obligations of sponsored projects as described above. Acceptance of a gift usually precludes any accounting and reporting by the University. If you have any questions regarding the above terms, please contact the Office of Sponsored Programs at 404.894.6937 or the Office of Foundation Relations at 404.894.2481.
Who is my contracting officer? Contracting officers are assigned based on the type of sponsor. For example, if a researcher is submitting a proposal to the National Science Foundation (NSF), the contracting officer will be the person who handles NSF proposals. Please use the OSP staff directory to find the name of the contracting officer who handles your sponsoring organization. Each PI/PD is also assigned a faculty coordinator within their department. If you don’t know who has been assigned as your faculty coordinator, please contact your department chair for details. What is our DUNS number? EIN number? What Congressional district are we in? All of this information is available on our Institutional Profile page. I will be using animal subjects, human subjects, or recombinant DNA in my study. Who gives me the permissions I need? The Office of Research Integrity Assurance works with faculty oversight committees and boards to promote the ethical conduct of research and to ensure compliance with regulatory requirements relating to research involving human subjects, vertebrate animal subjects, rDNA, synthetic nucleic acids, and export controlled research. When preparing a budget, researchers must estimate direct costs as well as indirect costs. Facilities and Administrative (F&A) rates, also called indirect costs or overhead rates, are used to account for operational or administrative expenses associated with research that cannot be precisely ascribed to any individual project. F&A rates reimburse the university for infrastructure and support costs associated with sponsored research projects. View Georgia Tech's F&A rates. How do I determine who gets fringe benefits? Fringe benefits are a direct cost to a sponsored project, are clearly related to the salaries and wages to be paid, and are shown as a separate entry in the budget. Full fringe benefit rates are applied to direct salary and wages of full-time employees and to part-time employees who work at least 50 percent time at Georgia Tech. Partial fringe benefits are applied to direct salary and wages of part-time employees who work less than 50 percent time at the Institute. These employees do not participate in the retirement, group health, and other insurance plans. Enrolled students maybe be employed on sponsored projects, and are not subject to fringe benefits rate charges. View current fringe benefit rates. How do I get an advance project number? The OSP contracting officer will (1) obtain confirmation that the sponsor intends to authorize the work, as well as negotiate contract terms and conditions in good faith, and (2) confirm the agreement effective date has been established such that any advance project charges will be allowable and recoverable from the sponsor. Cost sharing refers to funds that the University or a third-party are contractually obligated to contribute to a sponsored project, above and beyond the funds provided by the sponsor. These expenses represent the University's contribution to an externally funded sponsored project. It can be mandatory (required by the sponsor) or voluntary (offered by the University). If cost sharing is part of the sponsored research agreement, it must be recorded in the University's accounting system, included in financial reports submitted to the sponsor, and taken into account when calculating Facilities and Administrative (F&A) rates. Whenever cost sharing is proposed as part of a sponsored project, the source of funds must be identified and approval obtained from the individual with authority to commit those funds. How are F&A costs determined? F&A costs (also known as "overhead") reflect the actual cost of conducting research at Georgia Tech and are not extra money, or profit, attached to research contracts. F&A funds reimburse actual expenses Georgia Tech has already incurred to support research activities. They are real costs related to buildings, maintenance, utilities, equipment, insurance, safety, administration, compliance, legal, etc. For example, when Georgia Tech adds a new state-of-the-art research facility, or when tuition increases, F&A costs rise. View Georgia Tech's F&A rates. In addition, the new Uniform Requirements (2 CFR 200) from the Office of Management and Budget (OMB) allow for a more equitable recovery of utility-intensive research space costs by way of a relative energy utilization index (REUI). The rates we charge our sponsors then increase to ensure our expenses are covered. The costs incurred through industry research are usually a bit higher because industry contracts are complex and require more attention from our administrative and legal/contracting teams. F&A is applied as a rate to a Modified Total Direct Cost (MTDC) base. What is included in the MTDC base? Direct salaries and wages, applicable fringe benefits, materials and supplies, services, and travel up to the first $25,000 of each subcontract (regardless of the period of performance of the subcontracts under the award). MTDC excludes equipment, capital expenditures, charges for patient care, rental costs, tuition remission, scholarships and fellowships, participant support costs, and the portion of each subcontract in excess of $25,000. Will this rate change affect my current grants and contracts? It depends. Per Federal Uniform Requirements (2 CFR 200), F&A rates are fixed for the life of the federal award. "Life" is defined as each competitive segment. F&A rates on non-federal awards are updated with each change in rates. I'm submitting a proposal before July 1. Do I include the current or the proposed rates? I have been notified by a federal agency that a proposal has been accepted and that negotiation will likely be completed before July 1. What rates will apply? The current fiscal year rates will apply. The negotiation for a new contract based on an accepted proposal will not be completed until after the start of the next fiscal year. What rates apply? The rates approved for the next fiscal year will apply. Why doesn't Georgia Tech's Executive Vice President for Research (EVPR) Office return F&A costs to research faculty, as is done at other research universities? In addition to recovering costs for facilities and administration, Georgia Tech invests recovered F&A costs in research activities through startup packages, cost share requests, and equipment investment. How do Georgia Tech's rates compare to our peer institutions? Why the variance? Georgia Tech's F&A rates are comparable to rates at our peer institutions. Variances are caused by any number of factors including: new and existing research space; differences in the facilities and administration components between institutions; and pre-determined vs. fixed with carry forward rates, which would include adjustments for previous over or under recovery. I have heard there is a 26 percent administrative cap imposed by the government. What is that? And why is that cap not applied to the industry rate? It is true that the federal government imposes a 26 percent cap on the administrative portion of F&A rates. Georgia Tech's administrative costs historically are above 26 percent. Because this is a federal cap, it is not applied to the industry rate, which is a true measure of actual F&A costs. The decision was made to leave the industry rate the same for the 2014-2015 fiscal years, although below actual costs, then increase the rate up to 2 percent per year over a three-year period until we can fully recover our expenses related to industry research. This change is reflected in the proposed F&A rate schedule. What is a Proposal Routing Form and why is it used? The Proposal Routing Form is used to (1) collect basic information about your sponsored research project and (2) gather required approvals/signatures. Before any proposal is mailed to a funding agency, it must first be “routed” through the GIT internal review process. The internal review process for external funding proposals ensures compliance with federal, state, and institutional regulations and promotes accuracy in all budgetary and institutional information. Internal review processes can be viewed through this flowchart. How do I upload a proposal to OSP? Instructions are provided here: http://osp.gatech.edu/documents/Proposal_Upload.pdf. How do I find out information about my project? As a Georgia Tech employee you have access to GTCrossroads. You will login using your GT Account ID and Kerberos password. From there you can navigate to the OSP Contract Information System (Reports & Tools >> OSP Systems >> OSP Contract Information System) to search by sponsor name, PI name, or project number. The database provides standard project information, such as amount awarded, project contacts, project term, and deliverable due dates/status. Scanned Documents - To see scanned contract documents, go to the “Contractual Docs” tab and choose “All Documents.” Please note that scanned documents currently render correctly only in Internet Explorer. If you are unable to find the information you need in GTCrossroads, please contact the contracting officer identified as “OSP Contact” under the Project Administrative Data section of the “Project Header” tab. Alternatively, you can identify the contracting officer by assigned area of responsibility as listed here. Contact Raj Vuchatu if you encounter technical difficulties. How can I find out how much money is left on my award? The Research Portal was developed to provide researchers and research administrators with direct access to financial and administrative information related to sponsored awards. This tool can be used to see how much money is left on an award. How do I submit deliverables? How do I disclose an invention? The first step toward commercializing your innovation begins with an initial disclosure to the Office of Industry Engagement. Through this process, Industry Engagement can record the innovation, determine what form of intellectual property is involved, establish accurate inventorship as well as ownership interests in the innovation, and evaluate the innovation’s commercial potential. If you have developed something that you believe to be novel, you should report it to the Office of Industry Engagement. To make this process as efficient as possible, Industry Engagement has developed an online system, Web Disclosure, that allows for secure online submission of innovations by faculty, staff, and students. Anyone with Georgia Tech Kerberos credentials can log into Web Disclosure. Learn more about reporting an innovation at Georgia Tech. How can I find qualified small businesses for subcontracting opportunities? Organizations receiving federal funding for contracts are required by law to offer subcontracting opportunities to businesses in several special classifications: small businesses (SBs), small disadvantaged businesses (SDBs), women-owned small business concerns (WOSBs), historically black colleges and universities (HBCUs), minority institutions (MIs), businesses located in historically underutilized business zones (HUBZones), veteran-owned small businesses, and disabled-veteran businesses. This requirement may apply to contracts (not grants) of $500,000 or more. Georgia Tech’s Office of Sponsored Programs assists principal investigators with the preparation of small business plans when the sponsor requires them. Perhaps the most frequently encountered difficulty is the sourcing of qualified firms, and we have been able to identify several resources. On campus, the single most reliable resource is the Procurement & Business Services department, which maintains records on numerous vendors. For assistance, contact Paula Britton, Procurement Contracting Officer, at 404.894.3684. Another source is the Small Business Administration’s Pro-Net. Pro-Net is an Internet-based database of information on more than 195,000 small, disadvantaged, 8(a), HUBZone, and women -owned businesses. It is free to federal and state government agencies as well as to those seeking small business contractors, subcontractors, and/or partnership opportunities. This site links directly to a list of Certified HUBZone businesses. Businesses profiled on the Pro-Net system can be searched by SIC codes, key words, location, quality certifications, business type, ownership race and gender, EDI capability, and more. The Pro- Net project is a cooperative effort among SBA's Offices of Government Contracting, Minority Enterprise Development, Advocacy, Women's Business Ownership, Field Operations, Marketing & Customer Service, the Chief Information Officer, and the National Women's Business Council. The federal government’s Office of Small and Disadvantaged Business Utilization (SADBU) is another means of locating businesses within these special categories. Many government contracting sites have SADBU representatives who are eager to assist in small business plan preparation and in identifying potential small business sources. How do I create a request to initiate a new subaward or modify an existing subaward? From the subagreement site map, click on: "make a request for new subagreement" or "make a request for modification on an approved subagreement"
After completing or changing the fields, click on: "Submit to OSP"
Why isn't a subaward initiated by OSP after receipt of an award if a subrecipient was identified in the proposal? In addition to OSP obtaining signatures to support a department and institutional commitment, the department is given the opportunity to make the request for subaward to ensure that any changes to the research plans since the proposal was submitted are captured. Does OSP process requests when the funding source is state funds? No. Procurement and Business Services processes all activities when the funding source is state funds (i.e. Internal Research and Development (IRAD), foundation funds, and departmental discretionary funds). Exceptions may exist for seed grants, Georgia Research Alliance (GRA) funds, and crowd-funding requests if institutional regulatory compliance oversight is required. Why does OSP process subawards funded with seed grants and crowd-funding? OSP processes these subawards to ensure institutional regulatory compliance (i.e., Institutional Review Board (IRB), Institutional Animal Care and Use Committee (IACUC), and financial conflicts of interest) and, in some instances, to protect intellectual property. How do I determine whether an activity should go through OSP or Procurement? The OSP Subrecipient Determination Tool provides information to consider when determining the appropriate instrument to be awarded. However, the tool does not provide the contract type (i.e., fixed price, cost reimbursement, cost plus fixed fee, or time and materials). Selection of the appropriate contract type will be based on another series of questions related to risk, such as a recipient's financial stability, level of facility clearance, clearly defined scope of work, and milestone payment schedules. Can I request a subaward/subcontract even if I didn't propose a subaward? Yes. However, restrictions may apply. Contractual consent must be obtained via a notification to the sponsoring agency. The notification must include a revised award budget to show how the funds will be realigned to support the subaward/subcontract costs. What if I misclassified the relationship in my technical and cost proposal? Changes in classification will affect the cost proposal (for example, indirect is applied more heavily on contractors versus subrecipients). In most cases, the sponsor should be notified about this change. Check your award terms and conditions and follow up with your Contracting Officer (CO). What best describes a subrecipient relationship? In using sponsored funds to support subaward activities, you are responsible for determining whether a relationship is that of a subrecipient or a contractor. A subrecipient is a non-federal entity that receives federal funds from Georgia Tech and has decision-making responsibilities for carrying out a federal program. An example of a subrecipient relationship is that of a GT researcher collaborating with a counterpart in pursuit of advancing knowledge and understanding of a research question, and moving the basic research question from theory to possible production. What best describes an independent contractor relationship? Contractors provide services that are ancillary to the research effort and are within normal business operations. An example is buying goods or services off-the-shelf or from a catalogue and using them as advertised with little or no product changes. Other examples include developing webpages and building widgets based on a Georgia Tech Principal Investigator's (PI) technical specifications. What best describes an employee? I need to develop a subrecipient monitoring plan. Where do I begin? Georgia Tech Policy 5.3 Subrecipient Monitoring states: "Georgia Tech is responsible for ensuring that all subrecipients of its sponsored research awards are in compliance with applicable requirements in accordance with 2 CFR 200 Subpart D Subrecipient Monitoring and Management and Subpart F – Audit Requirements, when it is expected that the subrecipient's Federal awards expended during the respective fiscal year equals or exceeds $750,000 (2 CFR 200.501)." 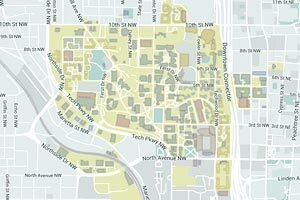 Review Georgia Tech's policy and additional guidelines in detail here. What are some subrecipient risk considerations and how can I mitigate risk? Subcontractor Entity or Organization Type: Is the subrecipient foreign-owned, a university, a non-profit organization, or a small business? Past Performance: Is the entity eligible to receive federal dollars? Is there information available regarding experiences on previous awards? Financial: Were there any material weaknesses, material instances of noncompliance, or findings identified in the subrecipient's latest A133 audit? Are there any non-compliance financial disclosures (i.e., CAS disclosures)? Compliance: Will any institutional compliance regulatory reviews apply to the subrecipient's scope of work? Examples include: Internal Revenue Service (IRS), IRB, IACUC, biohazard and safety, export control, salary and rate caps, and equipment (government furnished or purchased). Where should subrecipients submit their invoices? Subrecipients may forward all invoices directly to OSP either via postal mail, e-mail or fax. E-mail submissions are preferred. How are subrecipient invoices processed? OSP downloads received invoices and performs a preliminary review prior to scanning them into the Imagenow system along with supporting documentation. PIs are encouraged to work with department financial managers to review and approve subrecipient invoices. Always engage your CO if subrecipient invoices contain any questionable costs. What should I watch for when approving invoices for payment? Are the billed costs consistent with the proposed budgeted line items? Is the correct indirect rate being billed? Is the subrecipient spending money too quickly? Will the money run out before the work is complete? Is the subrecipient billing monthly or in accordance with the subagreement invoicing instructions? Are the costs within the amount allocated to the subagreement and within the performance period? Is the performance end date approaching? If so, we will send closeout notices and encourage subrecipients to submit their final costs as soon as possible. Under new regulations we have only 90 days to financially close the prime and will need subrecipients' final costs to complete our final closeout. When can subrecipients invoice and receive payment? Subrecipients must submit a certified invoice and any required supporting documentation for work satisfactorily performed during the previous month. Georgia Tech, as a state agency, is prohibited from authorizing advanced payments to subrecipients. Once received, OSP will route a subrecipient's invoice to the department for approval. The PI and/or financial manager may submit a requisition in Buzzmart after the subagreement initiation is complete. Who can assist the technical team in establishing teaming agreements? The OSP subaward team issues and negotiates teaming agreements when Georgia Tech is the lead on the proposal. Download the Teaming Agreement Routing Form from the OSP Form Library. What if a non-disclosure agreement (NDA) is needed between GT and a subrecipient/subcontractor? NDAs for research related activities are negotiated by Georgia Tech's Office of Exchange Agreements. Additional information can be found here. What should be considered in completing a technical cost analysis? The PI is required to provide a technical assessment of the subaward budget. The assessment should include verification that the costs are reasonable and necessary to carry out the proposed project. The cost elements within the subaward budget must be necessary to accomplish the proposed activity. Why is a technical cost analysis required? The government is responsible for ensuring that Georgia Tech maintains adequate policies and procedures governing subcontracting activities on federally sponsored grants and contracts. These activities are monitored through the periodic Contractor Purchasing Systems Review (CPSR) conducted on campus by the Office of Naval Research (ONR) every three years. Cost price analysis information that PIs provide when requesting a subaward is a key component in the government's review of our purchasing system. What is OSP's role in documenting cost analysis? It is not possible for OSP personnel to determine whether a price is fair and reasonable without input from others. OSP can evaluate costs, but assistance will be required from the responsible project director and/or PI to assess the appropriateness of the total price. See Cost Price Analysis for additional information. Who should I contact if I have questions about subawards? Please notify the Division Manager, Ashley Williams (404-385-2085), if any questions or concerns arise, including issues such as (1) subrecipient needs additional time or funds and/or (2) disputes over performance of the agreed statement of work. Are there any restrictions on hiring a former Georgia Institute of Technology (GIT) or Georgia Tech Research Institute (GTRI) employee as a consultant? Federal and state tax and labor laws require Georgia Tech to ensure that individuals who provide services are properly classified as an employee or an independent contractor. Proper classification of an individual will determine Georgia Tech's tax withholding and reporting obligations. Individuals who perform services for Georgia Tech are presumed to be employees unless the relationship, supported by documentation, satisfies the IRS and state law standards for an independent contractor status. Individuals who receive a Form W-2 from Georgia Tech should be paid as an employee for all services provided and typically should not also receive a Form 1099 from Georgia Tech. Please consult OSP if you have questions about classification. Are there restrictions on hiring former government employees? Yes. There is a “cooling off” period. The Procurement Integrity Act (41 U.S.C. §423, implemented at FAR 3.104) has four basic provisions (see this Procurement Integrity Act white paper for more information). Please contact your CO if the proposed subaward requires the use of a former government employee. How do I start a research center at Georgia Tech? If you are interested in starting a research center at Georgia Tech, please consult the Research Center Manual for details. What is the joint Emory/Georgia Tech Biomedical Engineering program? The Wallace H. Coulter Department of Biomedical Engineering at Georgia Tech and Emory University was created jointly by the Emory University School of Medicine and the Georgia Tech College of Engineering. The program is dedicated to improving the health and wellbeing of all by fostering the next generation of leaders in biomedical engineering worldwide. Learn more about the program. Federally funded research and development centers, or FFRDCs, are unique independent entities sponsored and funded by the U.S. government to meet specific long-term technical needs that cannot be met by any other single organization. FFRDCs typically assist government agencies with scientific research and analysis, systems development, and systems acquisition. They bring together the expertise of government, industry, and academia to solve complex technical problems. FFRDCs operate as strategic partners with their sponsoring government agencies to ensure the highest levels of objectivity and technical excellence. They are typically managed by a university or nonprofit parent organization; however, some are managed by industrial firms. First established during World War II, FFRDCs operate in the industries of defense, energy, aviation, space, health and human services, and tax administration. There are currently more than 40 different FFRDCs funded by the government. Georgia Tech has performed research for many FFRDCs including Oak Ridge National Laboratory, National Renewable Energy Laboratory, Sandia National Laboratory, Jet Propulsion Laboratory, Lawrence Livermore National Laboratory, Argonne National Laboratory, Lawrence Berkeley National Laboratory, Pacific Northwest National Laboratory, and others.